Suzuki Street Motorcycle Repair Manuals: Intruder, Marauder, Volusia, Savage, GS, etc. The Suzuki motorcycle repair manuals we sell cover a wide selection of the most popular street bikes from the 1970s, such as GS models and the famous GT Triples,to modern bikes such as the Savage, Intruder and Volusia. These Suzuki motorcycle manuals are written with the DIY mechanic in mind, and they are packed with step-by-step instructions and photos that allow Suzuki street bike owners to perform maintenance, service and repairs on their bikes. with the right repair manual. There are plenty of good reasons to take a few hours every few months for the "care and feeding" of your Suzuki motorcycle. A well maintained bike will run better, last longer, maintain its resale value, and save you money both on gas and on repair bills, to name a few of those good reasons. And performing regular maintenance on your Suzuki street bike is a simple task that requires just a few basic tools, a clean well-lit area and the right repair and service manual which will give you all kinds of tips on how to perform those tasks, both with text and plenty of photos or illustrations. Browse these Haynes and Clymer manuals. Suzuki maintenance and repair is far easier when you have the right instructions, and these manuals are available for various models and years. But the Suzuki manuals we sell do not stop there. They provide complete care and repair details that allow you to tear down components, such as the brake system, cooling system (if so equipped), forks, electrical and more, all the way to the engine and transmission, so you can completely rebuild the motorcycle from the ground-up. The repair manuals for Suzuki we offer are intended for the do-it-yourself mechanic, so they explain sequential steps in simple terms and, if a special tool is required to perform a job, they explain that. Remember that The Motor Bookstore gives you a 30-day money-back guarantee in case you're not satisfied with your purchase. But we are confident that once you get your Suzuki repair manual, it will become an important part of your toolbox and a constant source of information for as long as you own your motorcycle. 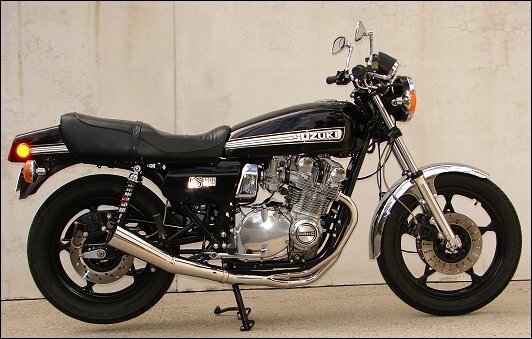 Above: Colin Hart's 1978 Suzuki GS1000 -- an older restoration he still owns and enjoys. Australia.